Mirvac’s dual-level Array East Penthouse at its Yarra’s Edge precinct has taken out one of the industry’s highest accolades after being named Apartment of the Year at the 2016 HIA-CSR Australian Housing Awards. The national accolade comes after winning Apartment of the Year at the Victorian awards in November last year. Mirvac’s Head of Residential, John Carfi, said the awards recognised the intelligence of Array’s design and Mirvac Design’s strong attention to detail. “These awards are fantastic recognition of Array’s iconic design and the new level of quality, finish and customisation it offers,” he said. 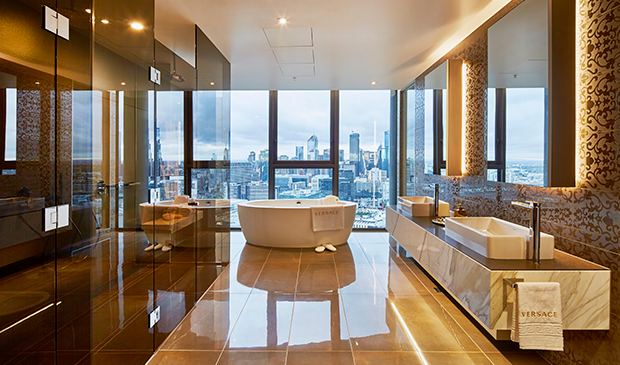 Array’s 425 square metre, four bedroom East Penthouse was applauded for its quality of workmanship and design innovation which has resulted in a dual- level penthouse with expansive terrace overlooking Melbourne’s Yarra River to the CBD and beyond. It was further enhanced by international illustrator Megan Hess, who styled the interior spaces, sourcing some of the most opulent imported furnishings, including bespoke Versace, Fendi and Roberto Cavalli pieces and furniture created by Hess herself. Launching off-the-plan in 2012, the 39 level tower features 199 apartments in total, including the award winning East and West penthouses. Array’s lavish lobby features a striking backlit onyx wall, twinkling overhead star lights and plush furnishings, as well as a 250 square metre retail space, currently home to an art gallery and cafe. The building’s residents are well catered for, with an onsite resident’s gym and lounge area. For boating enthusiasts, occupants can further enhance their waterfront lifestyle and own a berth with Marina YE right on their doorstep. The thriving Yarra’s Edge precinct is fast transforming into a prosperous waterfront community, currently home to more than 2,500 residents.